There are two common procedures for declawing cats; onychectomy and tendonectomy. 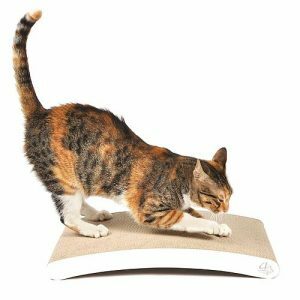 Generally the procedure is performed on the front limbs due to the fact that cats normally use the front paws for scratching activities. Onychectomy involves “removing the third phalanx either using a blade, guillotine-type nail clipper or surgical laser” (Schwartz, 2011). 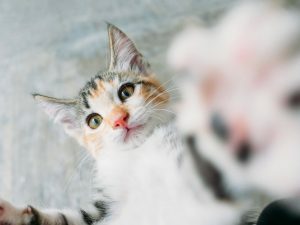 The third phalanx is the outermost bone in a cat’s paw which includes the claw and has supportive tissue, such as tendons, that must be severed during the procedure. An equivalent human anatomy comparison for the most common declaw operation of onychectomy is the removal of each finger from the tip to the first knuckle. The tendonectomy procedure “severs the deep digital flexor tendon to prevent the cat from flexing and extending the third phalanx” (Schwartz, 2011). A five to ten millimeter section of the flexor tendon is removed (as cited in “Welfare Implications of Declawing of Domestic Cats”, 2009). To put the length of tendon removed into perspective, many modern smart phones are roughly five to ten millimeters in depth. The human anatomy comparison for tendonectomy is similar to onychectomy except the portion of the finger would remain, however the ability to articulate the finger would be diminished. The loss of tactile feedback in these two cases for cats or humans would present physical challenges such as grabbing or holding objects. According to Yeon (2001), veterinarians recommend tendonectomy more often. Tendonectomy is commonly believed to lessen tissue damage during surgery versus onychectomy and therefore reduce postoperative pain. However, a clinical study at Washington University concluded there was no evidence of differences in pain observed between cats undergoing either procedure (Cloutier, 1989). Because the cat no longer has the ability protrude the claw for scratching, he cannot perform the routine maintenance activities of claw cuticle removal. The irony of a tendonectomy procedure is the owner must continue to trim the cat’s claws to prevent overgrowth. 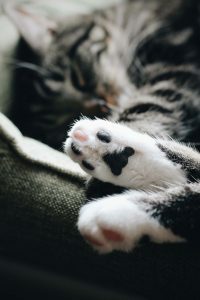 Failure by the owner to maintain the claw growth on a frequent basis can result in the cat having to face a second surgical procedure such as onychectomy. Cloutier, S. (2004). Behavioural Signs of Postoperative Pain in Cats Following Onychectomy or Tenectomy Surgery. Applied Animal Behaviour Science, 92(4), 325-335. Schwartz, S. (2011). Onychectomy & Tendonectomy. NAVC Clinician’s Brief. 79-83. Yeon, S.C. (2001). Attitudes of Owners Regarding Tendonectomy and Onychectomy in Cats. Journal of the American Veterinary Medical Association, 218(1), 43-47. Cats maintain their claws by shedding the outer sheathing which results in a sharper talon. A trimming interval of two to four weeks will keep them in check. 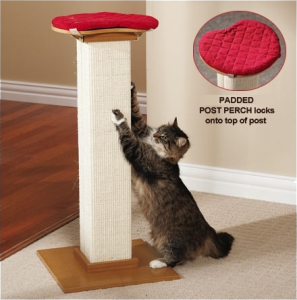 Cats will instinctively scratch to shed the sheathing on their claws and to stretch. Place numerous posts (vertical and horizontal) on various levels of the home. If they are choosing a piece of furniture, place the scratching surface near the furniture and coax them to use the scratching surface. You may need to use furniture-safe spray as a deterrent and/or double-sided tape on the affected part of the furniture for a period of time.